Equipo Nizkor - Treaty for the Prohibition of Nuclear Weapons in Latin America and the Caribbean - Treaty of Tlatelolco. b. The receipt, storage, installation, deployment and any form of possession of any nuclear weapons, directly or indirectly, by the Parties themselves, by anyone on their behalf or in any other way. 2. The Contracting Parties also undertake to refrain from engaging in, encouraging or authorizing, directly or indirectly, or in any way participating in the testing, use, manufacture, production, possession or control of any nuclear weapon. For the purposes of this Treaty, the term "territory" shall include the territorial sea, air space and any other space over which the State exercises sovereignty in accordance with its own legislation. 1. The Zone of application of this Treaty is the whole of the territories for which the Treaty is in force. 2. Upon fulfillment of the requirements of Article 29, paragraph 1, the Zone of Application of this Treaty shall also be that which is situated in the western hemisphere within the following limits (except the continental part of the territory of the United States of America and its territorial waters): starting at a point located at 35� north latitude, 75� west longitude; from this point directly southward to a point at 30� north latitude, 75� west longitude; from there, directly eastward to a point at 30� north latitude, 50� west longitude; from there, along a loxodromic line to a point at 5� north latitude, 20� west longitude; from there, directly southward to a point at 60� south latitude, 20� west longitude; from there, directly westward to a point at 60� south latitude, 115� west longitude; from there, directly northward to a point at 0� latitude, 115� west longitude; from there, along a loxodromic line to a point at 35� north latitude, 150� west longitude; from there, directly eastward to a point at 35� north latitude, 75� west longitude. For the purposes of this Treaty, a nuclear weapon is any device which is capable of releasing nuclear energy in an uncontrolled manner and which has a group of characteristics that are appropriate for use for warlike purposes. An instrument that may be used for the transport or propulsion of the device is not included in this definition if it is separable from the device and not an indivisible part thereof. At the request of any of the Signatory States or if the Agency established by Article 7 should so decide, a meeting of all the Signatories may be convoked to consider in common questions which may affect the very essence of this instrument, including possible amendments to it. In either case, the meeting will be convoked by the Secretary General. 1. In order to ensure compliance with the obligations of this Treaty, the Contracting Parties hereby establish an international organization to be known as the "Agency for the Prohibition of Nuclear Weapons in Latin America and the Caribbean", hereinafter referred to as "the Agency". Only the Contracting Parties shall be affected by its decisions. 2. The Agency shall be responsible for the holding of periodic or extraordinary consultations among Member States on matters relating to the purposes, measures and procedures set forth in this Treaty and to the supervision of compliance with the obligations arising there from. 3. The Contracting Parties agree to extend to the Agency full and prompt co-operation in accordance with the provisions of this Treaty, of any agreements they may conclude with the Agency and of any agreements the Agency may conclude with any other international organization or body. 4. The headquarters of the Agency shall be in Mexico City. 1. There are hereby established as principal organs of the Agency: a General Conference, a Council and a Secretariat. 2. Such subsidiary organs as are considered necessary by the General Conference may be established within the purview of this Treaty. 1. The General Conference, the supreme organ of the Agency, shall be composed of all the Contracting Parties; it shall hold regular sessions every two years, and may also hold special sessions whenever this Treaty so provides or, in the opinion of the Council, the circumstances so require. a. May consider and decide on any matters or questions covered by this Treaty, within the limits thereof, including those referring to powers and functions of any organ provided for in this Treaty. b. Shall establish procedures for the Control System to ensure observance of this Treaty in accordance with its provisions. c. Shall elect the Members of the Council and the Secretary General. d. May remove the Secretary General from office if the proper functioning of the Agency so requires. e. Shall receive and consider the biennial and special reports submitted by the Council and the Secretary General. f. Shall initiate and consider studies designed to facilitate the optimum fulfillment of the aims of this Treaty, without prejudice to the power of the Secretary General independently to carry out similar studies for submission to and consideration by the Conference. g. Shall be the organ competent to authorize the conclusion of agreements with Governments and other international organizations and bodies. 3. The General Conference shall adopt the Agency's budget and fix the scale of financial contributions to be paid by Member States, taking into account the systems and criteria used for the same purpose by the United Nations. 4. The General Conference shall elect its officers for each session and may establish such subsidiary organs as it deems necessary for the performance of its functions. 5. Each Member of the Agency shall have one vote. The decisions of the General Conference shall be taken by a two-thirds majority of the Members present and voting in the case of matters relating to the Control System and measures referred to in Article 20, the admission of new Members, the election or removal of the Secretary General, adoption of the budget and matters related thereto. Decisions on other matters, as well as procedural questions and also determination of which questions must be decided by a two-thirds majority, shall be taken by a simple majority of the Members present and voting. 6. The General Conference shall adopt its own Rules of Procedure. 1. The Council shall be composed of five Members of the Agency elected by the General Conference from among the Contracting Parties, due account being taken of equitable geographic distribution. 2. The Members of the Council shall be elected for a term of four years. However, in the first election three will be elected for two years. Outgoing Members may not be re-elected for the following period unless the limited number of States for which the Treaty is in force so requires. 3. Each Member of the Council shall have one representative. 4. The Council shall be so organized as to be able to function continuously. 5. In addition to the functions conferred upon it by this Treaty and to those which may be assigned to it by the General Conference, the Council shall, through the Secretary General, ensure the proper operation of the Control System in accordance with the provisions of this Treaty and with the decisions adopted by the General Conference. 6. The Council shall submit an annual report on its work to the General Conference as well as such special reports as it deems necessary or which the General Conference requests of it. 7. The Council shall elect its officers for each session. 8. The decisions of the Council shall be taken by a simple majority of its Members present and voting. 9. The Council shall adopt its own Rules of Procedure. 1. The Secretariat shall consist of a Secretary General, who shall be the chief administrative officer of the Agency, and of such staff as the Agency may require. The term of office of the Secretary General shall be four years and he may be re-elected for a single additional term. The Secretary General may not be a national of the country in which the Agency has its headquarters. In case the office of Secretary General becomes vacant, a new election shall be held to fill the office for the remainder of the term. 2. The staff of the Secretariat shall be appointed by the Secretary General, in accordance with rules laid down by the General Conference. 3. In addition to the functions conferred upon him by this Treaty and to those which may be assigned to him by the General Conference, the Secretary General shall ensure, as provided by Article 10, paragraph 5, the proper operation of the Control System established by this Treaty, in accordance with the provisions of the Treaty and the decisions taken by the General Conference. 4. The Secretary General shall act in that capacity in all meetings of the General Conference and of the Council and shall make an annual report to both bodies on the work of the Agency and any special reports requested by the General Conference or the Council or which the Secretary General may deem desirable. 5. The Secretary General shall establish the procedures for distributing to all Contracting Parties information received by the Agency from governmental sources and such information from non-governmental sources as may be of interest to the Agency. 6. In the performance of their duties the Secretary General and the staff shall not seek or receive instructions from any Government or from any other authority external to the Agency and shall refrain from any action which might reflect on their position as international officials responsible only to the Agency; subject to their responsibility to the Agency, they shall not disclose any industrial secrets or other confidential information coming to their knowledge by reason of their official duties in the Agency. 7. Each of the Contracting Parties undertakes to respect the exclusively international character of the responsibilities of the Secretary General and the staff and not to seek to influence them in the discharge of their responsibilities. 1. For the purpose of verifying compliance with the obligations entered into by the Contracting Parties in accordance with Article 1, a Control System shall be established which shall be put into effect in accordance with the provisions of Articles 13-18 of this Treaty. c. That explosions for peaceful purposes are compatible with Article 18 of this Treaty. Each Contracting Party shall negotiate multilateral or bilateral agreements with the International Atomic Energy Agency for the application of its safeguards to its nuclear activities. Each Contracting Party shall initiate negotiations within a period of 180 days after the date of the deposit of its instrument of ratification of this Treaty. These agreements shall enter into force, for each Party, not later than eighteen months after the date of the initiation of such negotiations except in case of unforeseen circumstances or force majeure. 1. The Contracting Parties shall submit to the Agency and to the International Atomic Energy Agency, for their information, semi-annual reports stating that no activity prohibited under this Treaty has occurred in their respective territories. 2. The Contracting Parties to the Treaty shall simultaneously transmit to the Agency a copy of the reports submitted to the International Atomic Energy Agency which relate to matters subject of this Treaty that are relevant to the work of the Agency. 3. The information furnished by the Contracting Parties shall not be, totally or partially, disclosed or transmitted to third parties, by the addressees of the reports, except when the Contracting Parties give their express consent. 1. At the request of any of the Contracting Parties and with the authorization of the Council, the Secretary General may request any of the Contracting Parties to provide the Agency with complementary or supplementary information regarding any extraordinary event or circumstance which affects the compliance with this Treaty, explaining his reasons. The Contracting Parties undertake to co-operate promptly and fully with the Secretary General. 2. The Secretary General shall inform the Council and the Contracting Parties forthwith of such requests and of the respective replies. 1. The International Atomic Energy Agency has the power of carrying out special inspections in accordance with Article 12 and with the agreements referred to in Article 13 of this Treaty. 2. At the request of any of the Contracting Parties and in accordance with the procedures established in Article 15 of this Treaty, the Council may submit for the consideration of the International Atomic Energy Agency a request that the necessary mechanisms be put into operation to carry out a special inspection. 3. The Secretary General shall request the Director General of the International Atomic Energy Agency to transmit to him in a timely manner the information forwarded to the Board of Governors of the IAEA relating to the conclusion of the special inspection. The Secretary General shall make this information available to the Council promptly. 4. The Council, through the Secretary General shall transmit this information to all the Contracting Parties. Nothing in the provisions of this Treaty shall prejudice the rights of the Contracting Parties, in conformity with this Treaty, to use nuclear energy for peaceful purposes, in particular for their economic development and social progress. 1. The Contracting Parties may carry out explosions of nuclear devices for peaceful purposes -including explosions which involve devices similar to those used in nuclear weapons- or collaborate with third parties for the same purpose, provided that they do so in accordance with the provisions of this Article and the other articles of the Treaty, particularly Articles 1 and 5.
e. The fullest possible information on any possible radioactive fall-out that may result from the explosion or explosions, and measures which will be taken to avoid danger to the population, flora, fauna and territories of any other Party or Parties. 3. The Secretary General and the technical personnel designated by the Council and the International Atomic Energy Agency may observe all the preparations, including the explosion of the device, and shall have unrestricted access to any area in the vicinity of the site of the explosion in order to ascertain whether the device and the procedures followed during the explosion are in conformity with the information supplied under paragraph 2 of this Article and the other provisions of this Treaty. 4. The Contracting Parties may accept the collaboration of third parties for the purpose set forth in paragraph 1 of the present Article, in accordance with paragraphs 2 and 3 thereof. The Agency may conclude such agreements with the International Atomic Energy Agency as are authorized by the General Conference and as it considers likely to facilitate the efficient operation of the Control System established by this Treaty. 1. The Agency may also enter into relations with any international organization or body, especially any which may be established in the future to supervise disarmament or measures for the control of armaments in any part of the world. 2. The Contracting Parties may, if they see fit, request the advice of the Inter-American Nuclear Energy Commission on all technical matters connected with the application of this Treaty with which the Commission is competent to deal under its Statute. 1. The General Conference shall take note of all cases in which, in its opinion, any Contracting Party is not complying fully with its obligations under this Treaty and shall draw the matter to the attention of the Party concerned, making such recommendations as it deems appropriate. 2. If, in its opinion, such non-compliance constitutes a violation of this Treaty which might endanger peace and security, the General Conference shall report thereon simultaneously to the United Nations Security Council and the General Assembly through the Secretary General of the United Nations, and to the Council of the Organization of American States. The General Conference shall likewise report to the International Atomic Energy Agency for such purposes as are relevant in accordance with its Statute. None of the provisions of this Treaty shall be construed as impairing the rights and obligations of the Parties under the Charter of the United Nations or, in the case of State Members of the Organization of American States, under existing regional treaties. 1. The Agency shall enjoy in the territory of each of the Contracting Parties such legal capacity and such privileges and immunities as may be necessary for the exercise of its functions and the fulfillment of its purposes. 2. Representatives of the Contracting Parties accredited to the Agency and officials of the Agency shall similarly enjoy such privileges and immunities as are necessary for the performance of their functions. 3. The Agency may conclude agreements with the Contracting Parties with a view to determining the details of the application of paragraphs 1 and 2 of this Article. Once this Treaty has entered into force, the Secretariat shall be notified immediately of any international agreement concluded by any of the Contracting Parties on matters with which this Treaty is concerned; the Secretariat shall register it and notify the other Contracting Parties. Unless the Parties concerned agree on another mode of peaceful settlement, any question or dispute concerning the interpretation or application of this Treaty which is not settled shall be referred to the International Court of Justice with the prior consent of the Parties to the controversy. a. 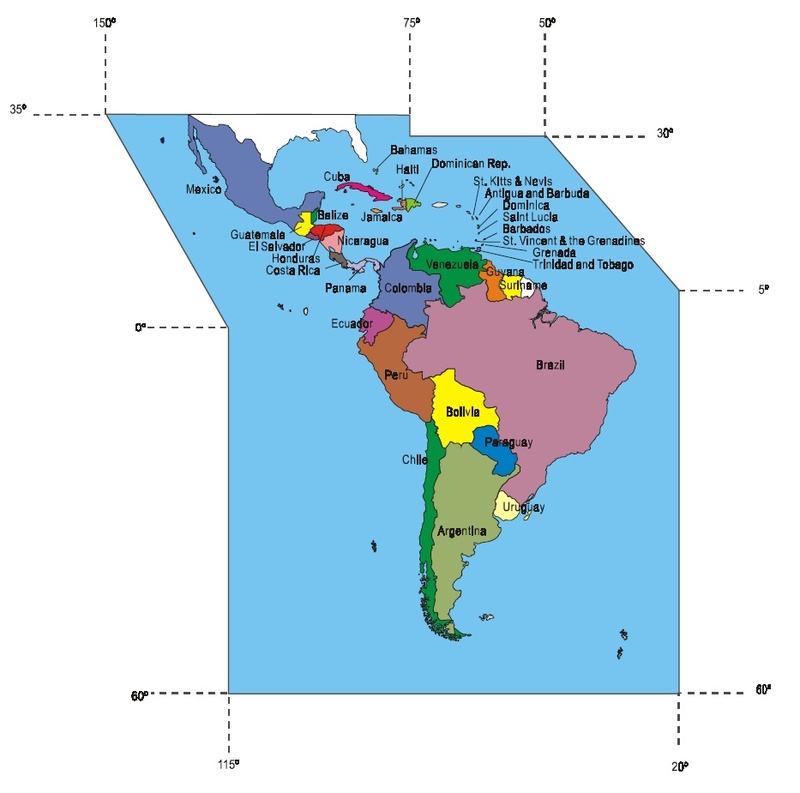 All the Latin American Republics, and the Caribbean. b. All other sovereign States in the western hemisphere situated in their entirety south of parallel 35� north latitude; and, except as provided in paragraph 2 of this Article, all such States when they have been admitted by the General Conference. 2. The condition of State Party to the Treaty of Tlatelolco shall be restricted to Independent States which are situated within the Zone of application of the Treaty in accordance with Article 4 of same, and with paragraph I of the present Article, and which were Members of the United Nations as of December 10, 1985 as well as to the non-autonomous territories mentioned in document OEA/CER.P, AG/doc. 1939/ 85 of November 5, 1985, once they attain their independence. 1. This Treaty shall be subject to ratification by Signatory States in accordance with their respective constitutional procedures. 2. This Treaty and the instruments of ratification shall be deposited with the Government of the Mexican United States, which is hereby designated the Depositary Government. 3. The Depositary Government shall send certified copies of this Treaty to the Governments of Signatory States and shall notify them of the deposit of each instrument of ratification. d. Conclusion of bilateral or multilateral agreements on the application of the Safeguards System of the International Atomic Energy Agency in accordance with Article 13 of this Treaty. 2. All Signatory States shall have the imprescriptible right to waive, wholly or in part, the requirements laid down in the preceding paragraph. They may do so by means of a declaration which shall be annexed to their respective instrument of ratification and which may be formulated at the time of deposit of the instrument or subsequently. For those States which exercise this right, this Treaty shall enter into force upon deposit of the declaration, or as soon as those requirements have been met which have not been expressly waived. 3. As soon as this Treaty has entered into force in accordance with the provisions of paragraph 2 for eleven States, the Depositary Government shall convene a preliminary meeting of those States in order that the Agency may be set up and commence its work. 4. After the entry into force of this Treaty for all the countries of the Zone, the rise of a new power possessing nuclear weapons shall have the effect of suspending the execution of this Treaty for those countries which have ratified it without waiving requirements of paragraph 1, subparagraph c) of this Article, and which request such suspension; the Treaty shall remain suspended until the new power, on its own initiative or upon request by the General Conference, ratifies the annexed Additional Protocol II. 1. Any Contracting Party may propose amendments to this Treaty and shall submit its proposals to the Council through the Secretary General, who shall transmit them to all the other Contracting Parties and, in addition, to all other Signatories in accordance with Article 6. The Council through the Secretary General, shall immediately following the meeting of Signatories convene a Special Session of the General Conference to examine the proposals made, for the adoption of which a two-thirds majority of the Contracting Parties present and voting shall be required. 2. Amendments adopted shall enter into force as soon as the requirements set forth in Article 29 of this Treaty have been complied with. 1. This Treaty shall be of a permanent nature and shall remain in force indefinitely, but any Party may denounce it by notifying the Secretary General of the Agency if, in the opinion of the denouncing State, there have arisen or may arise circumstances connected with the content of this Treaty or of the annexed Additional Protocols I and II which affect its supreme interests or the peace and security of one or more Contracting Parties. 2. The denunciation shall take effect three months after the delivery to the Secretary General of the Agency of the notification by the Government of the Signatory State concerned. The Secretary General shall immediately communicate such notification to the other Contracting Parties and to the Secretary General of the United Nations for the information of the United Nations Security Council and the General Assembly. He shall also communicate it to the Secretary General of the Organization of American States. This Treaty, of which the Spanish, Chinese, English, French, Portuguese and Russian texts are equally authentic, shall be registered by the Depositary Government in accordance with Article 102 of the United Nations Charter. The Depositary Government shall notify the Secretary General of the United Nations of the signatures, ratifications and amendments relating to this Treaty and shall communicate them to the Secretary General of the Organization of American States for its information. Denunciation of the declaration referred to in Article 29, paragraph 2, shall be subject to the same procedures as the denunciation of this Treaty, except that it will take effect on the date of delivery of the respective notification. In witness whereof the undersigned Plenipotentiaries, having deposited their full powers, found in good and due form, sign this Treaty on behalf of their respective Governments. Done at Mexico, Distrito Federal, on the fourteenth day of February, one thousand nine hundred and sixty-seven. To undertake to apply the statute of denuclearization in respect of warlike purposes as defined in Articles 1, 3, 5 and 13 of the Treaty for the Prohibition of Nuclear Weapons in Latin America and the Caribbean in territories for which, de jure or de facto, they are internationally responsible and which lie within the limits of the geographical Zone established in that Treaty. The duration of this Protocol shall be the same as that of the Treaty for the Prohibition of Nuclear Weapons in Latin America and the Caribbean of which this Protocol is an annex, and the provisions regarding ratification and denunciation contained in the Treaty shall be applicable to it. This Protocol shall enter into force, for the States which have ratified it, on the date of the deposit of their respective instruments of ratification. In witness whereof the undersigned Plenipotentiaries, having deposited their full powers, found in good and due form, sign this Protocol on behalf of their respective Governments. The statute of denuclearization of Latin America and the Caribbean in respect of warlike purposes, as defined, delimited and set forth in the Treaty for the Prohibition of Nuclear Weapons in Latin America and the Caribbean of which this instrument is an annex, shall be fully respected by the Parties to this Protocol in all its express aims and provisions. The Governments represented by the undersigned Plenipotentiaries undertake, therefore, not to contribute in any way to the performance of acts involving a violation of the obligations of Article 1 of the Treaty in the territories to which the Treaty applies in accordance with Article 4 thereof. The Governments represented by the undersigned Plenipotentiaries also undertake not to use or threaten to use nuclear weapons against the Contracting Parties of the Treaty for the Prohibition of Nuclear Weapons in Latin America and the Caribbean. The duration of this Protocol shall be the same as that of the Treaty for the Prohibition of Nuclear Weapons in Latin America and the Caribbean of which this Protocol is an annex, and the definitions of territory and nuclear weapons set forth in Articles 3 and 5 of the Treaty shall be applicable to this Protocol, as well as the provisions regarding ratification, reservations, denunciation, authentic texts and registration contained in Articles 27, 28, 31 and 32 of the Treaty. In witness whereof the undersigned Plenipotentiaries, having deposited their full powers found to be in good and due form, hereby sign this Additional Protocol on behalf of their respective Governments. This document has been published on 23Aug17 by the Equipo Nizkor and Derechos Human Rights. In accordance with Title 17 U.S.C. Section 107, this material is distributed without profit to those who have expressed a prior interest in receiving the included information for research and educational purposes.